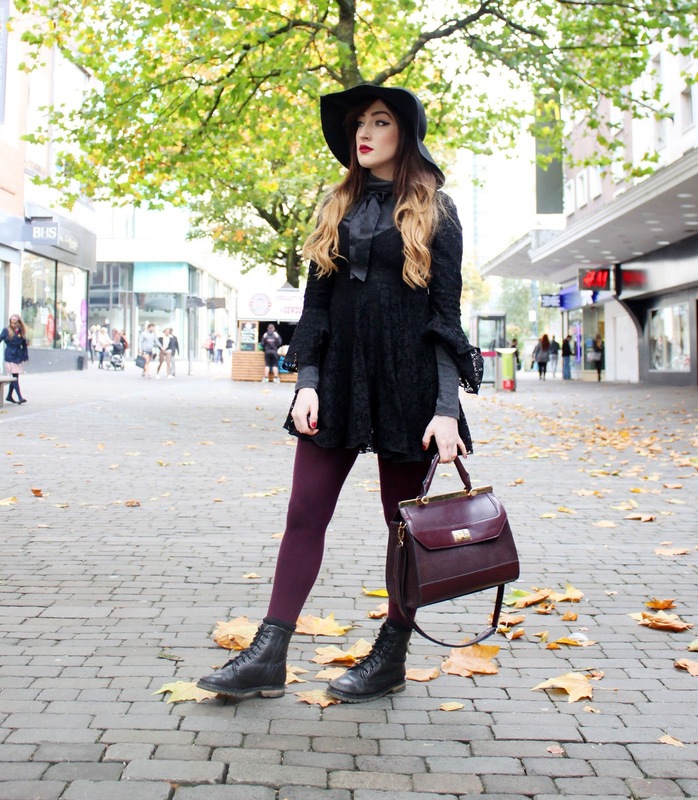 Hey guys I’m back with an Autumn look recently I have been wearing a lot of Black and Dark Purples, basically channelling some Witchy Vibes. I’ve even had comments shouted at on the streets that I look like a ‘Witch’ or that I’m ‘Fashionable’ which is something I just tend to laugh off now. I have come to the point where I don’t care what I wear anymore now I have my style mojo back. It disappeared over the Summer as I indulged in a crazy Gym Lifestyle. However, even though I enjoyed wearing tan everyday and probably being the healthiest/strongest I’ve ever been I can admit I wasn’t entirely happy. I noticed myself being quite controlled by what I ate and I knew it wasn’t enjoying it as it started to become a chore to eat as much protein as I needed and filling my body with food even when I wasn’t really hungry. I mean that’s not normal right? Just so I can remain lean… It did work but I love cake, chocolate, crisps just junk food. Its so great to indulge whilst your young and don’t gain weight. I will go back to the gym soon and try to attend about three days a week but I honestly couldn’t go everyday of the week it was too tiring on my body. I proved to myself I can do anything I put my mind to, but my true self loves food and thats ok. I was also very curious about the gym lifestyle I saw on Instagram and I wanted to experiment with my own identity to see if I could step into their shoes for a couple of months. At the end of the day I was born to dress weirdly, to enjoy fashion and to be creative. Thats who I am and I content to know that now. It takes time but at the age of twenty three the feeling of being self assured of your identity is such a great feeling. So here we are a bit of a witchy outfit for the month of Halloween. 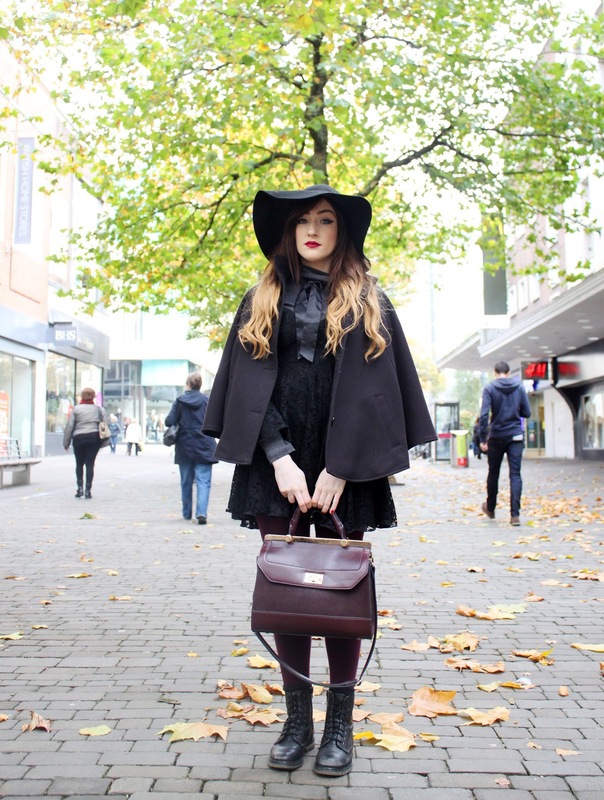 I love October so much and I want to be able to balance outfit posts along with my dissertation. I took these photos today in town, I can say I was so blinking nervous to take out my tripod and pose in front of the camera. 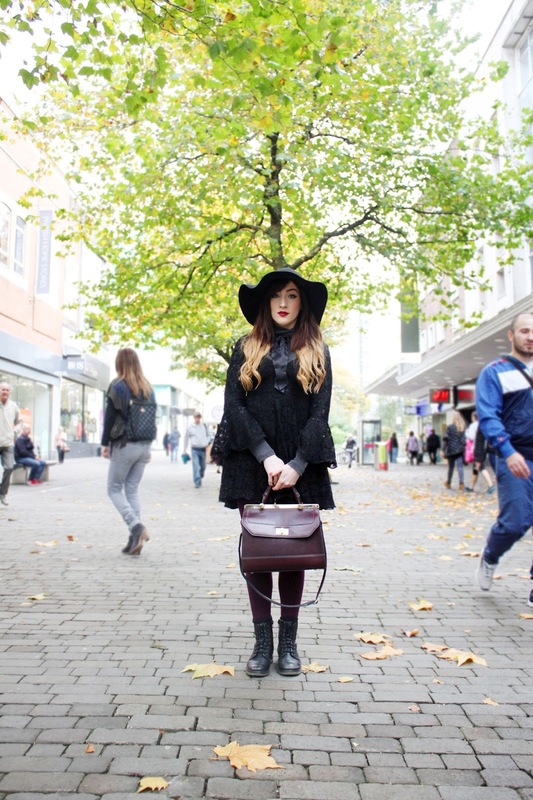 I haven’t blogged in such a long time and I actually enjoyed it a lot. I had many stares and questions but that makes it twice as fun to perform on the streets in town, its inspiring to change the scenery that people look at everyday. With this outfit I layered over a 70s laced dress on top of a grey turtle neck, the dress was quite low cut and I had never felt comfortable wearing it. Its also very short, so I chucked on a pair of thick warm tights and shorts underneath and it created such an interesting style. Hope you guys are all ok and still out there! I haven’t left the blogging world yet, in fact I am studying it very closely for my dissertation. There's nothing 'weird' about wanting to be creative with how you present yourself. I've had many looks and comments in the past about how I dress and the style that i've presented my life with, being told I'm a 'wannabe black guy' or that I'm 'following the crowd of the americans and french' who've adopted the neutral black and white colours that are somewhat pleasing to the eyes. But that isn't the case, if you're comfortable in the skin that you've grown up in, then it shouldn't matter what you case your skin in, unless you're not 100% happy with it. People can call you weird, stupid, and say that you're crazy, but at the end of the day. What's a canvas if it is not crazily and creatively put upon in a way to which stand out upon other canvases in the space! Your style isn't just pleasing to the eye, it's aesthetically pleasing to the mind, It's very rare to see some-what pride in appearance in a city which is bleak and dry. Conformity everywhere you look, mixed with the generic tracksuits and the odd 80's ''lets go for the hooligan look''! What's normal, If not wanting to stand out? and what's to stand out, if you want to be normal? Perfect and beautiful AUTUMN look and black dressing really suit you, in fact, black colors are just amazing, this color makes every other person looks beautiful.